For a city of less than fifty square miles and densely populated, San Francisco affords some remarkably rich birding habitat. Also, there is good variety. Native and exotic woodland lie within a few yards of open ocean beaches and rocky shoreline. A few hundred feet from a steep ocean bluff is the edge of the city's largest natural lake, surrounded by tules and century-old trees. A mid-summer day's birding in San Francisco can include Black Oystercatcher, Pygmy Nuthatch, Brown Creeper, Bushtit, Chestnut-backed Chickadee, Hooded Oriole, Scrub and Steller's Jays, Common Raven, Pigeon Guillemot, Bank Swallow, Violet-green Swallow, Clark's Grebe, Marsh Wren, Black Phoebe, Pacific-slope Flycatcher and Brandt's Cormorant. A winter day should bring you Surfbird, two turnstones, Wandering Tattler, at least fifteen duck species, three loon species, Golden-crowned Sparrows and a male Townsend Warbler that will make you catch your breath. The Presidio and Golden Gate Park together provide over 3000 acres of open space and public access. Situated at the south end of the Golden Gate and along the Pacific flyway, San Francisco has several good migrant traps for exciting fall birding. Also its location at the edge of the continent makes it a likely place for a handful of eastern vagrants every year. Click here for a list of likely target species for visiting birders which should help you know when, where and how to look. Before or during any visit, acquaint yourself regularly with the Northern California Birdbox (rare bird alert) whose phone number is 415-681-7422. It is constantly updated by the area's birders, and not merely a weekly summary. Here are some hints about local conditions. San Francisco's rainy season is November through March. While it rarely gets below 40-degrees Fahrenheit, winter storms can be wet, windy and unpredictable. Any time of the year the coastal portions of San Francisco can get ocean fog and wind. Do not expect to bird the Cliff House in shorts and sandals, even in August. "Hot" in San Francisco means 75-degrees Fahrenheit. If it gets to 80, the local populace complains about the heat. Homes here are not air conditioned, except by Mother Nature. Dress in layers if you're going to move around or bird for hours. Conditions change rapidly in one location, as well as place to place. It can be 55 degrees at the Cliff House and 75 at Candlestick. If fog comes in, the temperature can drop twenty degrees or the wind can triple in speed. If you are leaving the city for an inland location, the temperature in summer can soar. Livermore and Sacramento regularly get 100-degree temperatures. In winter the effect is reversed. While Christmas Bird Counts may get a fifty-degree day in San Francisco, there can be snow in the hills north or east of the city. This is a region of microclimates. Be prepared. There are few natural hazards. Poison oak. Fleas. Blowing sand at Ocean Beach on windy days. If you come from a humid climate, know that San Francisco is dry from April to October. Drink plenty of water. You can get sun-burned even on a foggy day. There are some urban hazards. Very expensive parking tickets. Towaway zones are to be respected if you are driving. Cars at Candlestick Point have been broken into. Don't bird there or Pier 98 alone. The other birding spots in San Francisco are as safe as you can be in an American city. If you plan to bird the area from Fort Funston north to Land's End, try to start early if it's a clear day. By the time the sun is overhead the glare off the water can be a problem. 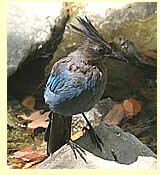 The Golden Gate Audubon Society has frequent free bird walks. They are a good way to get many of the local specialties. From September through April a good day in the field in San Francisco should net over a 100 species. The big day record for San Francisco (not counting any offshore birding) is over 120. The San Francisco Christmas Bird Count produces over 160 species annually, but includes some rich habitat in neighboring San Mateo County. In April and May you can sometimes see streams of loons, ducks and shorebirds heading north past Fort Funston or the Cliff House. Any season the six miles of Pacific Ocean coastline can produce a surprising bird. Even dolphins or a whale.